AMMONNEWS - Millions of Palestinian refugees “cannot simply be wished away”, the head of a UN support agency said on Monday, hitting back at a US aid cutoff and allegations its work only perpetuates their plight. The United Nations Relief and Works Agency (UNRWA) provides services to about 5 million Palestinian refugees across Jordan, Lebanon, Syria and the West Bank and Gaza. Most are descendants of some 700,000 Palestinians who were driven out of their homes or fled fighting in the 1948 war that led to Israel’s creation. The growing refugee count was cited by Washington, UNRWA’s biggest donor, in its decision last week to withhold funding, and has potential ramifications for the Palestinians’ pursuit of a right of return to land now in Israel. 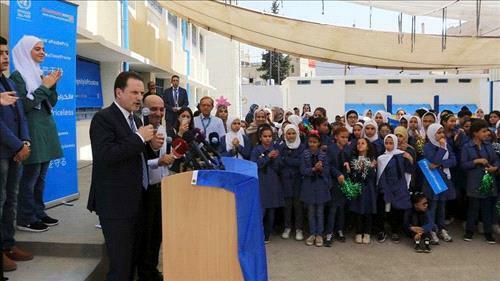 “I express deep regret and disappointment at the nature of the US decision,” UNRWA Commissioner-General Pierre Krahenbuhl said in an open letter to Palestinian refugees and the agency’s staff in which he pledged its operations would continue. Appearing to echo Israel’s view that descendants of the 1948 refugees should not share that status, State Department spokeswoman Heather Nauert criticized UNRWA on Friday over its “endlessly and exponentially expanding community of entitled beneficiaries”. Israeli Prime Minister Benjamin Netanyahu described UNRWA on Sunday as “the refugee perpetuation agency” whose money “should be taken and be used to really help rehabilitate the refugees, whose real number is a sliver of that reported by UNRWA”. But Krahenbuhl said “the protracted nature of the Palestine refugee crisis” was not unique. He said the children and grandchildren of long-displaced refugees in Afghanistan, Sudan, Somalia, Congo and elsewhere are also recognized as refugees and assisted by the United Nations. Washington’s move against UNRWA was the latest in a series of US and Israeli policy decisions that have angered Palestinians and raised international concern. They include Trump’s recognition of Jerusalem as Israel’s capital in December, the moving of the US Embassy to the contested city in May and Israel’s adoption of a “nation-state” law in July that says only Jews have the right of self-determination in the country.